Can someone provide identification and/or additional information for this material, found at the basement ceiling in a Park Ridge IL House built (according to tax records) 1944/45? - it's a bit different from any K&T wiring method/material I have encountered previously, and I'd like to precisely identify it in my report..
That looks like a K&T transition to a box. The loom is placed over the individual conductors before they enter a box. I seriously doubt that is was installed in 1944/45 though. They were using BX and even non-grounded Romex at that time. Not to mention, hasn't the Chicago area (union) always required that wiring be in conduit since the beginning of time? Agreed, clearly a transition. As far as dateing.. Pre-40s', but I'm in New England and am not aware of the rest of the country at that time. 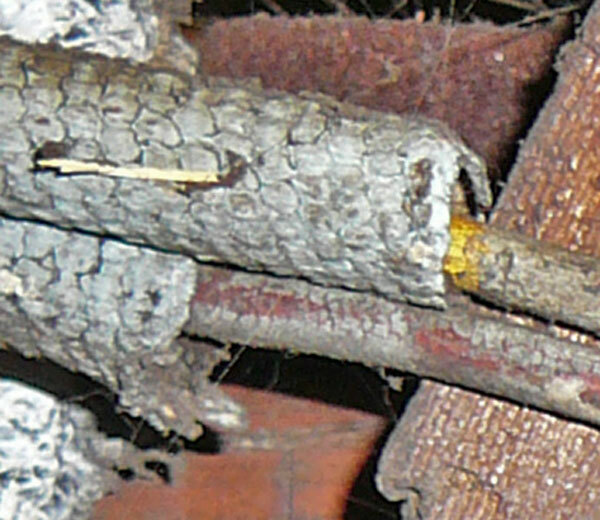 There is a definite wire color difference- looks like one wire has a yellow insulation and the other is red? Seems odd. If those are a hot and grounded conductors I was under the impression that there needed to be more separation and they can't be on the same knob, which was why cleats were used. Perhaps a switch leg? Explaining the same insulator. Asfar as color, I have seen alot of this with the later K&T. Shortly before the transition to cables. That is old K&T wiring. As stated the loom was used when the single conductor wire turned corners. 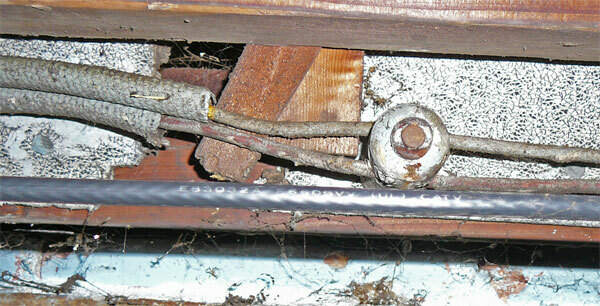 When wire was run in a straight line paralel to the floor joist, the K&T would rest under the individual knobs or when the crossed through the beams then the ran in the tubes. When you were running from the ceiling and wanted to turn down a wall. They electrician would slide the loom over the single 14 ga RH wire. It prevent the wire from chafing on the wooden beams. Here in northern NJ there is still a lot of K&T wiring in homes around here. Also as stated the loom would protect the singel strand wire when it entered a box. I remember that too. K&T was mostly prevalent out West after the 30's. However, judging by the fact that the wire spacing is not to code, even by early K&T standards, and 2 wires on 1 knob, I vote this is an old homeowner hack job. Two (2) wires on 1 knob? They are designed/mfg for two (2) conductors. As mentioned above, 'loom' was used at box entry points, and the conductors would have to be closely spaced to enter a device box; hence the 'loom'! What 'code' are you referencing for wire spacing?